Here are 10 representative listings from that bibliography. You may freely download a draft of the article, which contains the full bibliography, here. Kim Bobo, Jackie Kendall, and Steve Max, Organizing for Social Change: Midwest Academy Manual for Activists 4th ed. (2010). Manual for grassroots activists by leading trainers and educators associated with the Midwest Academy, which has trained thousands of activists since its creation in 1973. Community and the World: Participating in Social Change (Torry D. Dickinson, ed., 2003). This valuable and welcomed collection of articles covers many topics related to community-based learning, adult education, and scholarly activism, featuring a multicultural and global orientation. A diverse array of educators, learners, and social change agents contributed to it. John-Paul Flintoff, How to Change the World (2012). Provides a trenchant historical and practical overview on the different ways to make an impact on society. Howard Gardner, Changing Minds: The Art and Science of Changing Our Own and Other People’s Minds (2004). The renowned psychologist examines how people change their minds on matters ranging from everyday choices to major social and political issues. Robert Jensen, We Are All Apocalyptic Now: On the Responsibilities of Teaching, Preaching, Reporting, Writing, and Speaking Out (2013). A journalism professor, Jensen urges intellectuals to be “responsibly apocalyptic” in helping us to understand and confront the economic and social challenges of our era. Kathleen A. Kendall-Tackett, How to Write for a General Audience: A Guide for Academics Who Want to Share Their Knowledge With the World and Have Fun Doing It (2007). Helpful, encouraging guidebook for those who want to translate their research for more general audiences via articles, books, and social media. George Lakoff, Thinking Points: Communicating Our American Values and Vision (2006). Linguistics professor Lakoff applies his expertise to political communication, suggesting ways in which progressives can more effectively persuade the public. Michelle E. Martin, Advocacy for Social Justice: A Global Perspective (2015). Interesting takes on social justice advocacy, framed by human services and social work perspectives. The Public Intellectual (Helen Small, ed., 2002). Sampling of perspectives on the role of public intellectuals in society. The late Edward Said’s essay, “The Public Role of Writers and Intellectuals,” is particularly recommended. Telling Stories to Change the World (Rickie Sollinger, Madeline Fox & Kayhan Irani, eds. 2008). Stimulating collection of essays about storytelling as a strategy for social justice advocacy on a global scale. Think about it: What if individual character was a primary criterion for selecting our leaders in business, the public sector, and the non-profits? How would that improve our organizations, our society, and our quality of work life? On Friday and Saturday, I hosted a workshop for a group of lawyers and law professors who affiliate themselves with therapeutic jurisprudence, a legal philosophy that examines the therapeutic and anti-therapeutic properties of our laws and legal systems. TJ, as we call it, implicitly embraces legal outcomes that support psychological health and well-being. We enjoyed two great days of insightful, spirited, supportive discussions. I’ll be writing more about the overall workshop soon. The observation rings true for me. All too often, being able to sell one’s self in the room has become a dominant factor in selecting our leaders. Flash, style, and charisma — the “wow” impact — may crowd out other qualities that have deeper and longer-term significance. Character is among those qualities sometimes given the short shrift. Wouldn’t it be wonderful, however, if characteristics such as moral courage, honesty, empathy, and maturity were placed front and center in what we look for in our leaders? Think of what a better place the world would be if we did. Even we find ourselves swimming upstream on this one, when selecting leaders we should look at individual character and urge others to do the same. Can a quirky band of law professors, lawyers, and judges transform the law and legal profession? 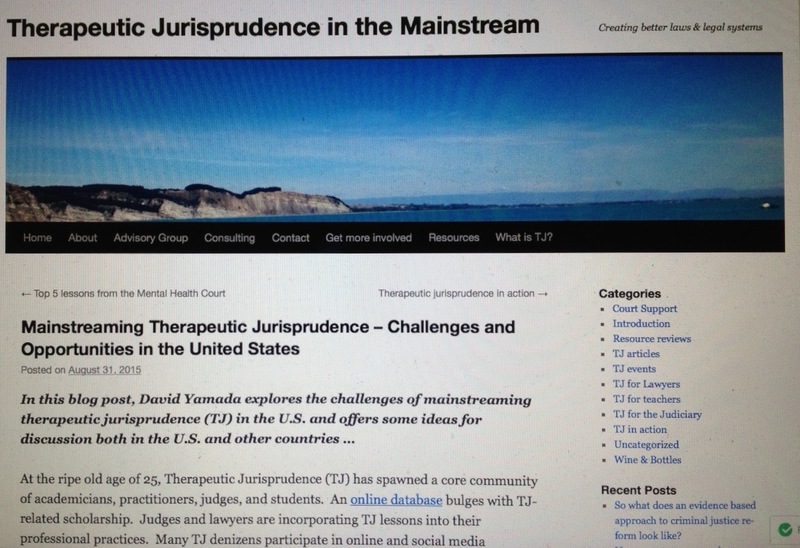 My guest blog post examining the challenges of mainstreaming therapeutic jurisprudence in the U.S. This Friday and Saturday, I’ll be hosting a workshop for a group of lawyers and law professors who affiliate themselves with therapeutic jurisprudence, a legal philosophy that examines the therapeutic and anti-therapeutic properties of our laws and legal systems. TJ, as we call it, implicitly embraces legal outcomes that support psychological health and well-being. We’ll be gathering at Suffolk University Law School for two great days of informal presentations and thoughtful exchanges. American lawyers and judges learn very early in their legal training – commonly, during the first year of law school – of the law’s discomfort with psychology, whether in interpreting tricky issues of intent or wrestling with how to incorporate insanity or incapacity into legal decision making. Furthermore, emotions are regarded as messy, getting in the way of analysis. When it comes to dealing with legal disputes, it’s easier to get the parties’ stories and apply rules to facts, hopefully without too much mucking around in the human mind and complicated feelings. I offer the hypothesis that many American lawyers, judges, legislators, and law students have little idea of how truly miserable the standard-brand civil or criminal litigation experience can be for most parties to a legal dispute. Being a party to litigation is, at best, a major distraction from more life-affirming activities, and often proves expensive, time consuming, intimidating, fearful, and stressful, with significant stakes in the result. We’ll have lots of good stuff to talk about! I look forward to welcoming participants David Wexler (TJ co-founder), Indira Azizi, Susan Brooks, Caroline Cooper, Heather Ellis Cucolo, Michael Jones, Shelley Kierstead, Alison Lynch, Michael Perlin, Amanda Peters, Marjorie Silver, and Carol Zeiner. The good news? He’s apparently not a Machiavellian who tells people what they want to hear for the sake of manipulating them. So when I say that presidential candidate Donald Trump is a racist hate-monger it’s not just a political pejorative. He has a constitutional right to hold and express racist views, but using those views to manipulate the intellectually vulnerable and mobilize active bigots requires a coherent response. As an expert on hate, I am more than comfortable stating that either Trump is a virulent racist or that he is willing to perform racism and use racism of others to advance his political position. At this juncture, Donald Trump is leading in many polls of Republican primary contenders. While I comprehend the potential appeal of a seemingly no-nonsense leader who promises to get things done in Washington D.C., let’s not confuse this brand of toxic, empathy-free “plain talk” with the qualities we need in our next President. They are not averse to causing a ruckus, nor are they above using a few public whippings and ceremonial hangings to get attention. 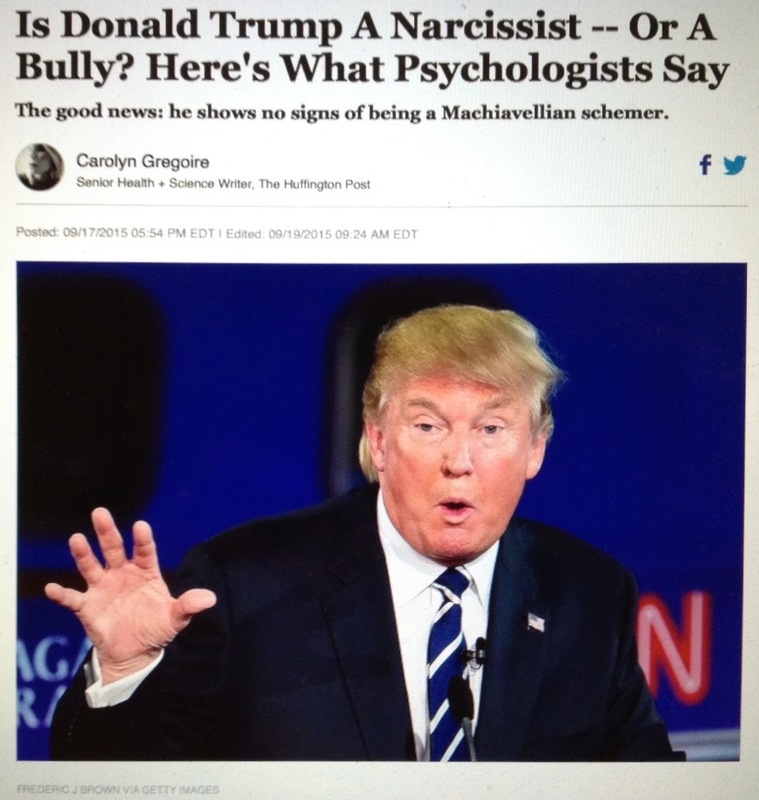 Kramer insists that the great intimidators aren’t your “typical bullies” driven by ego and the desire to humiliate others. No, he claims, these are people of vision. …or do we get the leaders we deserve? A recent Yahoo News commentary by Jerry Adler caused me to ask myself, once again, if we simply get the leaders we deserve. Adler was writing about the potential presidential candidacy of Vice President Joseph Biden, who lost his son Beau, 46, to brain cancer a little over three months ago. Understandably, that terrible loss has been a major factor, if not the major factor, weighing on Biden’s mind as he wrestles with the decision of whether or not to run. As a grieving father, Biden is permitted to show his emotions in public, but as a candidate, he can only show strength. In the piece, Adler speculates how Biden might react if Donald Trump, as the Republican nominee, questioned his capacity to serve in light of his son’s death. There are few more grueling marathons than a full-on presidential campaign. Joe Biden knows this as well as anyone else. However, the truism that candidates “can only show strength” is disturbing evidence of how American political discourse is stuck in a retrograde emotional zone where stereotypical “toughness” is valued highly and other displays of feelings must be tempered or hidden. Okay, so you’ve probably figured out that I could never vote for Donald Trump. But I’m not making an unqualified case for Joe Biden, either. For now, I’d simply like a better array of announced choices. During the Civil War, Lincoln was burdened by a difficult marriage and the death of a beloved young son, and he struggled with what now would be diagnosed as clinical depression. …I get why figures like Barack Obama and Hillary Clinton mean so much to so many people. And I understand why Ronald Reagan is so beloved by conservatives. However, in searching for the qualities of wisdom, compassion, resilience, and courage that we need today, I keep returning to Abraham Lincoln as a singular figure worthy of study and emulation. Yes, I know that invoking Lincoln is aiming awfully high. But it sure beats the typical political fare served up on cable news these days. One of the most valuable lessons I’ve learned over the years is that when you’re engaged in work and activities that feel right, you often find yourself connecting with exceptional people who bring a positive presence to the world. 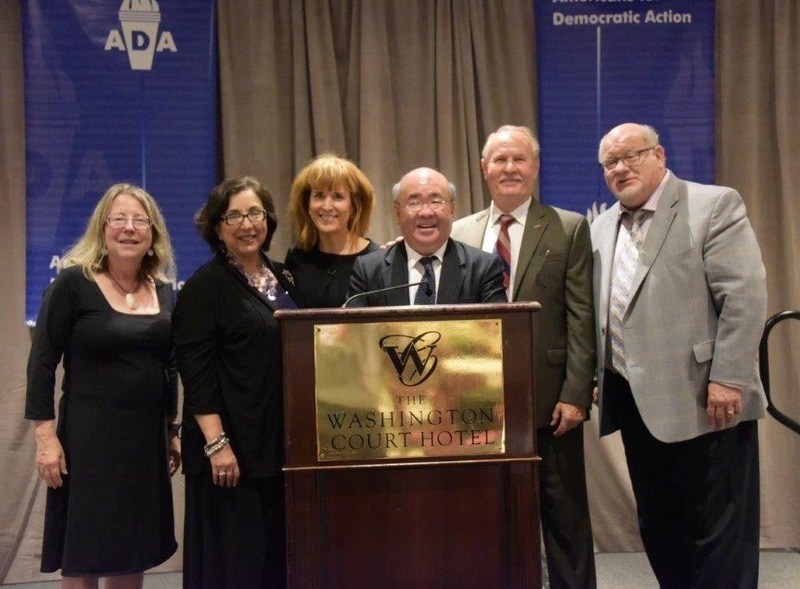 As I wrote in my last post, on Wednesday I had the pleasure of addressing the annual awards banquet of Americans for Democratic Action (ADA) in Washington, D.C. It was a great opportunity to share with fellow dinner attendees the work we have been doing in the states to advance the anti-bullying Healthy Workplace Bill. I was very fortunate to have at my table a group of dear friends, many of whom have been active in the workplace anti-bullying movement. After the dinner, several of us gathered at the podium for the picture above. It was a treat to spend the evening with these people. All the time. It is miraculous. I even have a superstition that has grown on me as the result of invisible hands coming all the time — namely, that if you do follow your bliss you put yourself on a kind of track that has been there all the while, waiting for you, and the life that you ought to be living is the one you are living. When you can see that, you begin to meet people who are in the field of your bliss, and they open doors to you…. I realize that “follow your bliss” can morph easily into the most banal forms of encouragement. Joseph Campbell was not a superficial person, but his signature line is tailor made for every soon-to-be-forgotten commencement speech or career pep talk, of which there are many. Furthermore, not everyone has the opportunity to follow this advice. Especially for those who are struggling to put food on the table and to keep a roof over their heads, such beyond-survival aspirations may appear to be unrealistic and even unattainable. However, with a leap of faith, I will assume that many readers here are likely to be blessed with some degree of choice over the activities they pursue and are motivated to make a positive difference during their lives. As Campbell suggests, following one’s bliss is not a static state of being; rather, it leads to connections and people. On this point I appeal to Drs. John Bilorusky and Cynthia Lawrence of the Western Institute for Social Research (WISR), a tiny, non-traditional university in Berkeley, California, devoted to social change and community engagement. They are fond of invoking the phrase, “one thing leads to another,” and they cite, as examples, WISR students whose learning projects, grounded in socially relevant topics of deep personal interest, have led them to connections and difference-making opportunities they may not have anticipated when they embarked on their work. Practicing in an intellectual activist mode, I have experienced a connectivity that echoes both Campbell (“you begin to meet people who are in the field of your bliss, and they open doors to you”) and Bilorusky & Lawrence (“one thing leads to another”). It is a place where one’s networks, circles, and tribes feel right in terms of shared or compatible goals, and where one’s activities and values are largely congruent. Some may experience this coalescence earlier in life. For me, the pieces did not come together until my fifties. I am extraordinarily grateful that they eventually did. One thing that wasn’t in sync at the ADA awards banquet was our technological know-how. I had hoped to post a video of my speech from Wednesday night, but unfortunately we had a glitch with the camera. Suffice it to say, however, that steady readers of this blog know most of what I had to say. I gave special attention to the progress that we’ve made in Massachusetts in moving the Healthy Workplace Bill through various committees in the legislature. A big thank you to those who took out program ads to support me, including SEIU/NAGE Local 282 (Greg Sorozan, President), Workplace Bullying Institute (Drs. Gary & Ruth Namie), Denise Doherty & Brian McCrane, Suffolk University Law School, Gail Almeida, and Jessica Stensrud. I also appreciated the many individuals, unions, and ADA local chapters who bought ads honoring all of the night’s awardees. Last night I received the Winn Newman Equality Award for my scholarship and advocacy on workplace bullying and workers’ rights at the annual awards banquet of Americans for Democratic Action in Washington D.C. I was one of three featured honorees, joining U.S. Senator Sherrod Brown (Ohio) and U.S. Representative Rosa DeLauro (Connecticut). 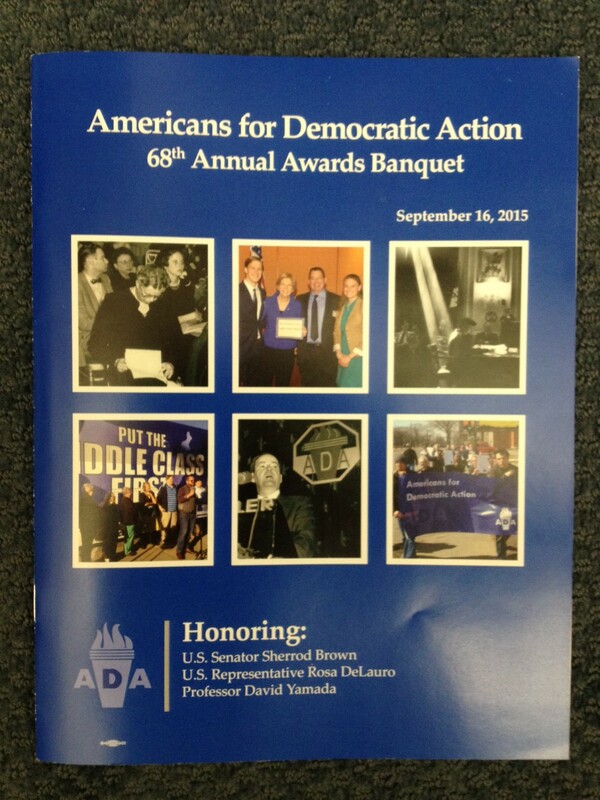 ADA is a venerable political and policy advocacy organization that has long championed workers’ rights and interests. I was on its national board for many years and served a term as its board chair. Last night’s event gave me an opportunity to share with a well-networked D.C. audience the work we have been doing in various states to make the anti-bullying Healthy Workplace Bill a reality. It appeared that my remarks were informative and well-received. We also were treated to wonderful speeches by Senator Brown and Representative DeLauro, whose support of working people in this country is second to none. I was joined at my table by a group of dear friends, many of whom have been active in workers’ rights and workplace anti-bullying efforts for years, including Gary Namie of the Workplace Bullying Institute and Greg Sorozan of the National Association of Government Employees. The dinner also gave me a chance to reconnect with friends from ADA. In fact, I’m pleased to report that I’ll be rejoining the ADA board as an at-large member. Whaddya mean, “don’t go back to school”?! It may seem odd for a university professor to be recommending a book whose title and content are all about not going back to school. 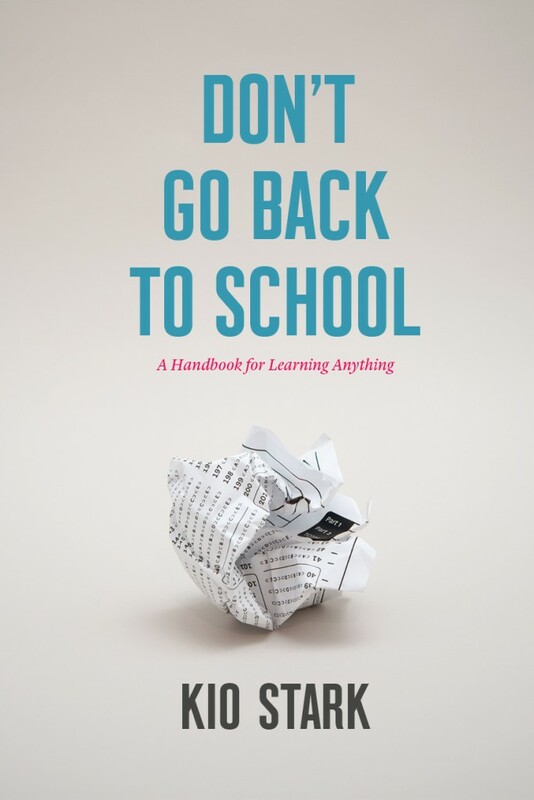 But I’ve had Kio Stark’s Don’t Go Back to School: A Handbook for Learning Anything (2013) on my bookshelf for some time now, and I finally took a good look at it over the weekend. I like it! Don’t Go Back to School is a terrific collection of essays by individuals who opted out or dropped out of degree programs (both undergraduate and graduate) to plot their own learning paths and achieved creative and vocational successes. It’s also a helpful resource guide for folks who want to explore ways to apply these lessons to their own learning and work. Here is a radical truth: school doesn’t have a monopoly on learning. More and more people are declining traditional education and college degrees. Instead they’re getting the knowledge, training, and inspiration they need outside of the classroom. Drawing on extensive research and over 100 interviews with independent learners, Kio Stark offers the ultimate guide to learning without school. Don’t Go Back to School provides models and methods for taking a new kind of path through learning, and transforming that alternative education into an exciting career path. This inspiring, practical guide provides concrete strategies and resources for getting started as an independent learner. If you’re debating whether college, trade school, or independent learning will get you where you want to be, Don’t Go Back to School is essential reading. I’m all for enrolling in degree programs that meet an individual’s needs and interests. A formal degree program with quality instruction, mentoring, and networking opportunities can be a powerful and useful experience. In today’s workplace, a bachelor’s degree, while falling short of being an absolutely essential credential, is nevertheless an important door opener for entering many fields. In vocational areas requiring some type of licensure, completion of formal degree or learning programs may be a necessity. Don’t Go Back to School is a worthy addition to the body of literature on lifelong learning. The individual essays are instructive and inspiring, and the resource listings are practical and helpful. For those who are weighing options and changes, this is a good read. It also might open up some exciting possibilities.